"This mayonnaise is quick and easy to make." In a bowl, whisk together the Dijon mustard and egg yolk. Slowly pour in olive oil while whisking rapidly. After all the olive oil is in the mixture, blend in the garlic and lemon juice. Season with salt and pepper. Turn regular mayo into a versatile, zesty sauce for so many favorite foods. I used this recipe and added some fresh Tarragon. 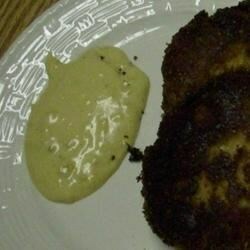 I then used it as a dipping sauce for fresh deepfried Artichoke hearts. It came out perfect. Although I added a little more oil, it was so thick.and also added extra garlic.